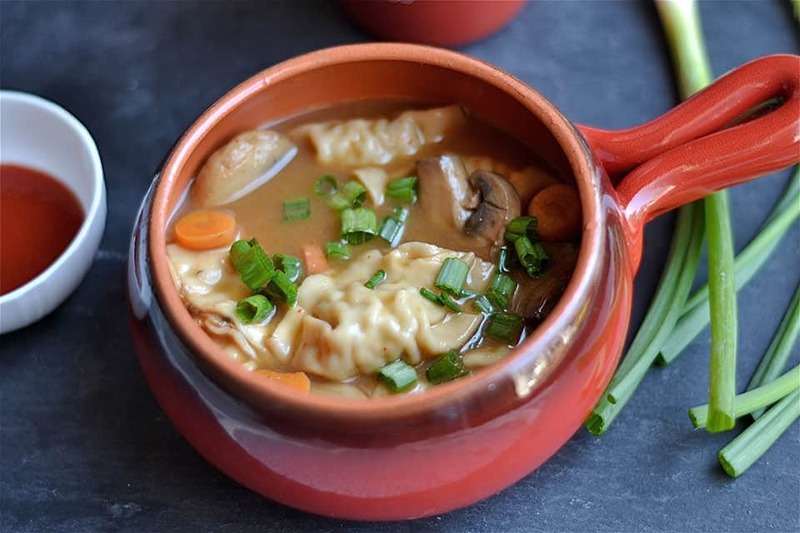 Hot and Sour Potsticker Soup is a tangy, slightly spicy, comforting bowl of soup that makes a great meal on cold days. 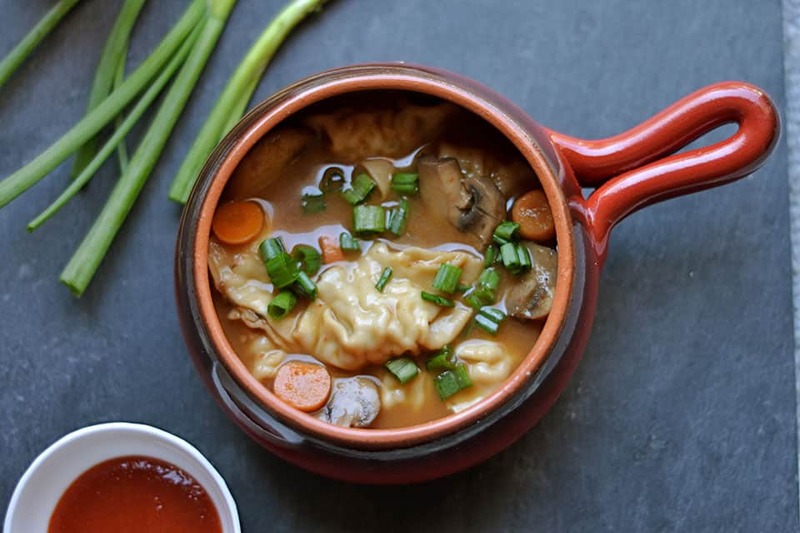 Fresh vegetables, with a tasty broth, and the added texture of potstickers make this soup a great alternative to Asian take-out! 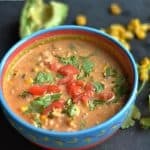 This soup is so easy to make and comes together quickly in 20 minutes. Chinese food has never been my thang. Just sayin. It’s always made my stomach hurt, given me heart burn, and I happen to think it’s too greasy and salty. So when my husband first introduced me to PF Changs, I was a little skeptical. One of the first things we tried was Hot and Sour Soup. I was sold. That was all I needed to realize I had just been having junk Chinese Food. Not that I think PF Changs is the gold standard when it comes to Chinese food, but I have since changed my views and love to make Chinese inspired dishes with healthier ingredients. So about this soup. I have quite a tangy, spicy, palette (maybe you’ve noticed??) 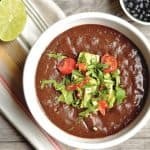 I craved Hot and Sour Soup when I was pregnant (along with jars of pepperoncinis). This version that I make is more a complete meal, and not the appetizer type that PF Chang’s serves. It’s also not as salty, and I happen to think this version is much tastier! The added potstickers make it more filling, and give it this great texture. You can adjust the spice and tang, by adding in more sriacha or rice vinegar. 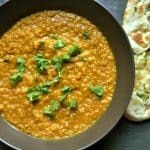 Serve on a cold night and enjoy!! Heat a large pot to medium high heat. Coat the pot with sesame oil, and add ginger, mushrooms, and garlic. Cook until mushrooms are softened (about 8 minutes). Add broth, vinegar, sriracha, and soy sauce. Bring to a boil and add carrots. Stir in potstickers, and cook for just a few minutes until potstickers are softened. Serve immediately and garnish with green onions. 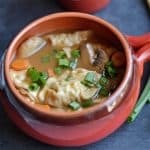 I use vegetable potstickers for a meatless soup, but feel free to use chicken or pork! 1/2 cup of rice vinegar and soy sauce? Is that right? It seems like a lot to me, but I went with it. I didn’t really care for the taste, and I’m pretty sure it’s the amount of rice vinegar and soy sauce that’s in the recipe. I tried counter-acting the tang of the vinegar and soy sauce with sugar, a little at a time. That kind of helped, but in the end, I ended up just eating the potstickers separately. Yes, Kasy, the measurements are correct. We eat it often and love the extra tang. Sorry it didn’t turn out for you! My sister, brother, and I enjoyed this soup. I’ve made it a couple times. It is hot and sour, so I wouldn’t recommend it for kids or anyone who may be sensitive to heat. I did make some minor variations. I put miso in my soup to I handed the depth of flavor. 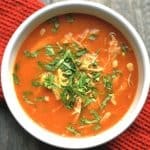 This soup is great if you’re sick because it will open the sinuses.